One of the best compression pants out there for yoga, running, cycling and host of other outdoor activities. Ideal for every day casual wearing. If you are not satisfied for any reason, 30-Days NO-QUESTION ASKED.100% Full Refund Assurance. This is a capri with 19” inseam with mid-waist broad elastic waist band for tummy control. The stylish design of waist band allows it to stay in place to provide you peace of mind during any type or workout. 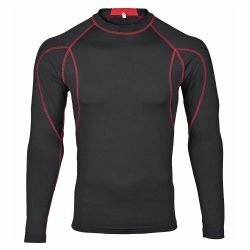 Premium quality fabric (87% Polyester, 13% Spandex) provides advanced moisture wicking functionality to keep you dry, cool and odor-free. Knee-level mesh inserts provide additional air flow for extreme warm temperatures. Multidirectional ultra-stretch Fit hugs your muscles to provide support needed during a workout and recovery. Enough thickness with breathability and NON-SEE through. Small hidden pocket to securely hold key or credit card. Gusseted crotch for comfort. Flatlock stitching to reduce irritation and chaffing. No annoying product tags. Ships free inside continental US.